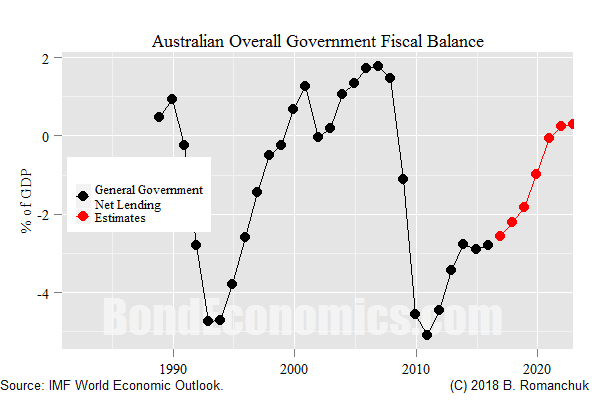 The chart above shows the (annual) fiscal balance for the general government sector of Australia (the general government sector includes sub-sovereign governments as well as the central government), taken from the IMF World Economic Outlook. As can be seen, there was a lengthy period of surpluses from the late 1990s - 2000s. This is somewhat unusual, and raises some questions about some interpretations of functional finance and Modern Monetary Theory (MMT). If we look at the situation more carefully, the fact that there were surpluses then was not too surprising, and is entirely consistent with functional finance principles. For the developed countries in the modern era, fiscal deficits are the norm. One can argue that this is the result of basic debt mathematics, which many advocates of balanced budgets conveniently ignore. The usual goal of policy is a "stable" debt-to-GDP ratio. (There is no good theoretical explanation of why this is the case, but that is not the concern here.) Since nominal GDP is growing in most developed countries most of the time (Japan acting somewhat as an exception), governments need to add debt to keep the numerator to grown in line with the denominator. As a result, we do not need a whole lot of theory to predict that the typical outcome is a fiscal deficit. One of the most important factors was that Australia -- like most of the "Anglo" countries -- has had an impressive bull market in house prices (and construction). The housing bubble in the United States popped, but not in Australia. One mechanical effect of higher house prices is that households need to borrow more to purchase them; hence household debt rises. I currently have not imported the full set of the Australian national accounts, but the chart above is indicative of the situation (taken from an IMF report, downloaded using the St. Louis Federal Reserve FRED interface). Unfortunately, it does not overlap the full period of surpluses, but we see that the ratio is rising while greater than 90% of GDP in 2006-2008. 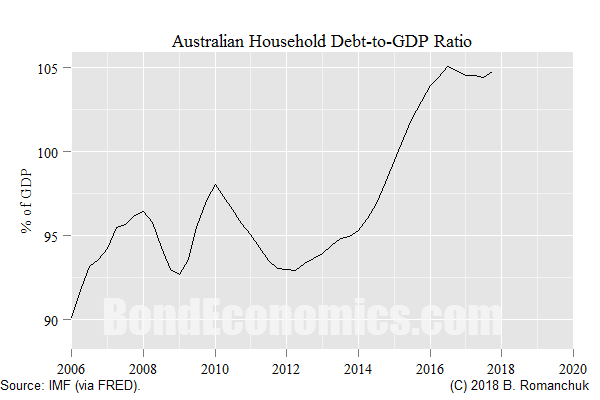 The implication is that some households have to emitting enough debt to not only keep up with growing nominal GDP as well raising the ratio. I have not crunched the numbers, but it is clear that the household debt issuance is going to be larger than the general government surplus. The business sector was presumably growing robustly during this period -- there was first the telecom boom, and then the commodity boom. I would assume that Australian equities also participated in the global equity bull market of that era, and so capital gains taxes would have been elevated. Since capital gains taxes are incurred in a somewhat voluntary fashion, they presumably have less of a dampening effect than income taxes. The final result is that the surplus was not unusual -- household debt issuance was more than enough to offset the general government financial surplus. Note that this argument is largely theory-free, although it might have problems if one chooses a sufficiently incorrect theory. For example, if one argues that the behaviour of the household sector can be modelled as the behavioural choices of a single representative household, household sector borrowing to purchase housing is neutral for growth, since it represents the same household borrowing from itself. Bill Mitchell, an Australian MMT academic, summarises the situation in this relatively recent article -- link. He has written detailed analysis of the data on his website earlier (I had not spotted them after a quick search; I will leave the search to an interested reader). A Blow to Functional Finance? However, there is a lot of discussion in the MMT literature that suggests that running surpluses is a bad idea and/or unsustainable in the long term. So long as the economy is growing in nominal terms, the private sector (including external sector actors, like reserve holding foreign central banks) tend to want to hold increasing nominal amounts of financial assets, particularly fixed income. However, there are limits of private sector entities to service debts, so growth driven by private sector debt issuance will generally tend to go off the rails eventually. The Australian housing market sidestepped 2008, but it is hard to see that performance being repeated for decades. Conversely, a central government borrowing in its own free-floating currency faces no risk of involuntary bankruptcy, and so its debts help to stabilise private sector portfolios. However, the inability to sustain surpluses for decades does not imply that surpluses can occur for a few years without a crisis. I noted the functional finance principle: you cannot tell what the fiscal stance is by looking at the fiscal balance. It is likely that this seems like a vague verbal formulation, but it is a useful theoretical point if we contrast it to conventional thinking. I will now flesh out the hidden details in that formulation. a time series of lump sum taxes that are fixed in real terms for all time. The "lump sum" specification means that the level of tax is fixed (in real terms) regardless of the wealth or income of the (representative) household; something like a poll tax. There is a single composite good in the economy, and so there is only a single good price to worry about, and one notion of production capacity (output gap). All households are the same: same income, same wealth, pay same taxes. The correct way of thinking about fiscal policy is start off with the parameters that the government actually controls (which could be viewed as exogenous). Government spending might appear straightforward, but it is actually a mix of income transfers, salary spending with wages set in multi-year settlements, contractual purchases of some goods and services, and open market purchases of others. Modern welfare states have programmes that are sensitive to the state of the economy, such as unemployment insurance and welfare. The demand effect is hitting a wide variety of goods and services, each with own capacity constraints. Obviously, if the government ramps up spending on goods that are in short supply, it will exacerbate price increases, whereas purchases where there is excess capacity will have little to no effect on prices. Tax codes are complicated, and come in a variety of forms. Even the base income tax rate is technically a continuum of tax rates defined over the set of incomes (although we can reduce the complexity by just looking at brackets and marginal tax rates). In other words, the government can control tax rates, but it cannot control how much taxes it collects. The fiscal balance is an outcome, not a variable that can directly set by policymakers. The outcome of the fiscal balance depends upon the nature of the economy: the external balance, investment trends, etc. For a country successfully pursuing an export-led growth strategy -- e.g., Japan up until the 1990s -- the government is likely going to tend towards surplus. Conversely, we should not be surprised that fiscal deficits are high in countries with ageing populations, current account deficits, and anaemic private sector investment. In summary, the fact that Australia ran a series of surpluses is not an issue for functional finance. I periodically see complaints that MMT has "no models or theory." From context, the complainers appear to be looking for reduced-form mathematical models. The fact that MMT avoids these reduced-form models is an advantage in my opinion -- despite the fact that my training is as an applied mathematician, and "quantitative analyst" appeared in one form or another on my business card for my career in finance. And one may note that I am hardly alone -- there's a small sub-culture of MMTers in rates finance, and modern rates investors are not normally thought of as literary theorists. The reason to avoid reduced form models is obvious to anyone with markets experience: pretty much every possible reduced-form mathematical model has been thrown at the macro data set, using every known fitting technique in applied mathematics. The results are uniformly dismal: at best, one can find a model that works for a period of time, then blows sky high when the regime shifts. This is exactly what (good) theory predicts. We can view observed data as being the outcome of a stock-flow consistent model with really complex behavioural functions. We are likely able to approximate those behavioural functions around some "operating point" -- which means that we can fit some reduced form model (with sufficient free parameters) to a limited run of data. Once we move away from the operating point, the model breaks down. Every competent, experienced rates investor knows this, so there is no reason to get excited about reduced-form models. Most failed reduced form models are proprietary, and so their track record is not publicly documented. However, we do have a spectacular documented example -- classical Monetarism. The standard interpretation of Milton Friedman's writings was that reduced form models based on (near) constant money velocity were valid. The implication is that all policy makers need to do is keep the money supply growing at k% a year, and we would achieve policy nirvana. Although it is easy to ridicule the models in retrospect (like I just did), the interest in Monetarism did indicate that the simplistic versions of the models appeared to be adequate approximations of reality. 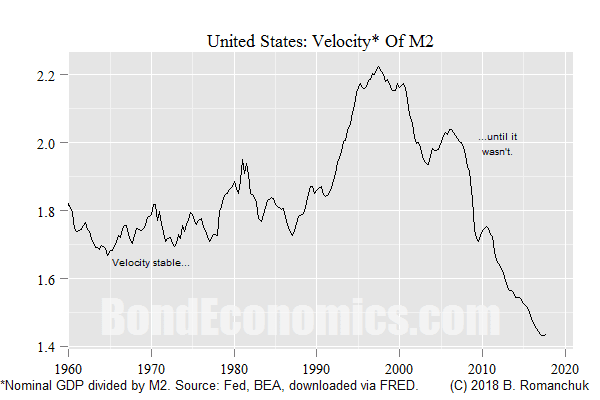 Any time one looks at a reduced form model, one needs to ask: why is the track record of the proposed model any more impressive than that of constant velocity models based on pre-1970s data? We now return to functional finance. One could try to summarise functional finance as: "sufficiently loose fiscal policy will eventually lead to inflation." The problem is quantification, and that is an inherent issue with fiscal policy. We cannot slap the fiscal balance into a reduced form model; we need to look at the variables that are exogenous. The problem is that they resist easy parameterisation. As noted earlier, income tax rates are a continuum, not a single percentage. Giving a tax break to billionaires is going to have less of an impact on growth than a reduction of deductions for public pensions. The modern corporate welfare state (particularly in the United States) is not defined in terms of crass subsidies, rather carve-outs of tax ("tax expenditures"). The entire objective of the exercise is to avoid having a well-defined dollar amount for the subsidy to corporate profits. And these measures are not stable: accelerating depreciation schedules is a standard tactic for fighting economic slowdowns. How do we describe things like changes to depreciation schedules in a model? Spending needs to broken down into its categories, and each acts differently within an economic model. In order to properly quantify these effects, we would need a relatively complex model. The reality is that such a model will end up with too many free parameters -- and we cannot fit it to data. As a result, any analysis of fiscal policy has to rely on a certain amount of instinct and guesswork. This reflects reality -- nobody can plausibly forecast the detailed effects of the Republican tax cuts on growth. We are only relatively safe if we imagine hypothetical extreme scenarios. What happens if central government spending is 20% of GDP, yet it cuts all tax rates to zero? Although we might not be able to predict exactly what would happen, it is a safe bet that the price level would rise a lot.